Kenyan shower. 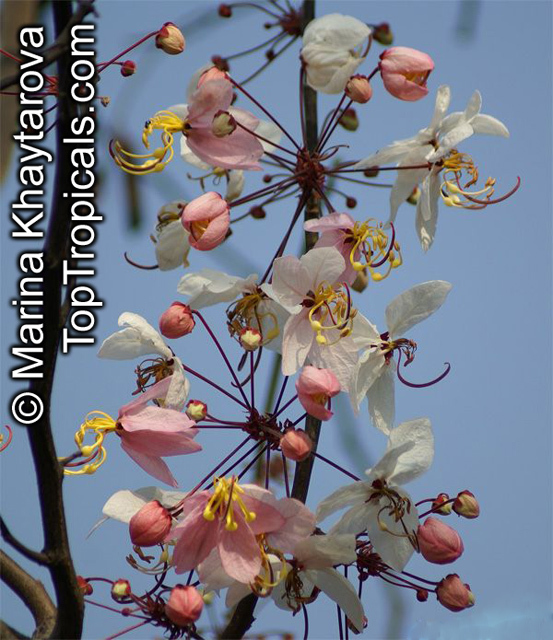 Spectacular flowering tree from East Africa with flowers arranged in vertical spikes. It is very rare in cultivation and available only in a few botanical gardens. Low growing shrub with dense foliage and profuse, showy golden flowers. Drought tolerant, easy to grow. Good for small places or container culture. 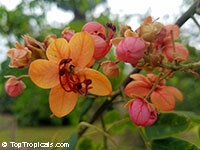 Dwarf Apple Blossom Tree, Pink Cassia, Pink Shower Cassia, Wishing-tree. A small compact tree with impressive delicate pink flowers, attracting bees and butterflies. Perfect choice for small yards and patios, nice container plant. Large trees will be topped for shipping. The Winter Cassia (Cassia bicapsularis or Senna bicapsularis) is a winter bloomer that puts on a wonderful floral display around the holiday season (although photos below-right were taken early May). The flowers are also very attractive to bees and butterflies. Soak seeds before planting. Plant 3/4" deep in well-drained mix. Keep lightly moist, warm and in bright light. The seeds can rot if soil is too wet. 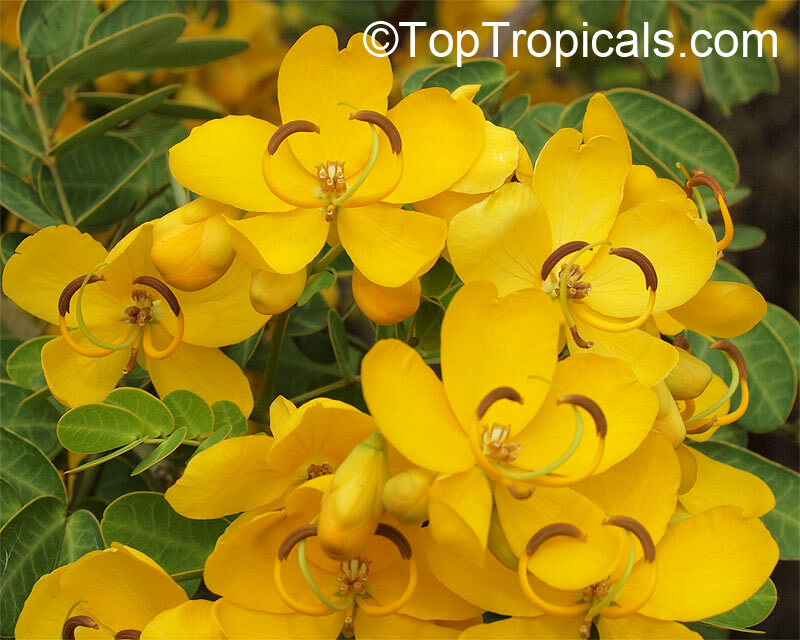 A free flowering, bushy, evergreen, small tree or large size shrub with large heads of yellow flowers resembling butterflies over many months. Rare red Cassia. 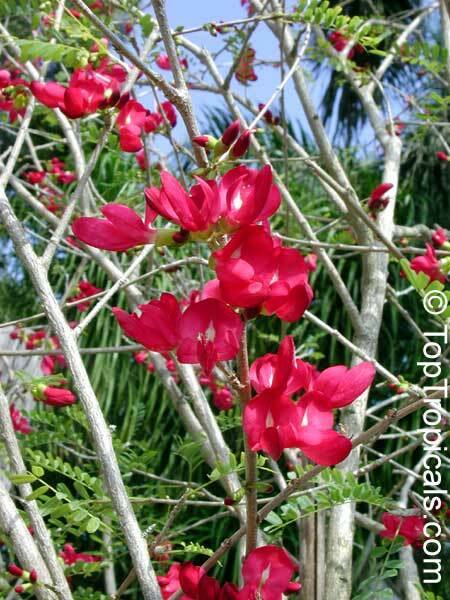 A medium size tree having profuse blooms of dark pink to crimson flowers throughout the Spring. 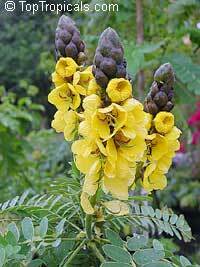 It usually blooms earlier (February-April) than many of its common relatives. The sweet pulp of fruit is edible and used as a laxative. Medium to large size tropical tree. 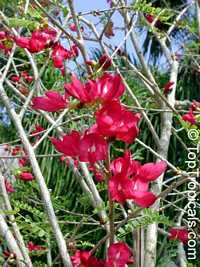 The "coral shower tree" usually blooms earlier than many of its common relatives. Soak seeds before planting for 24 hours. Plant 1" deep. Keep warm, damp and in bright light. 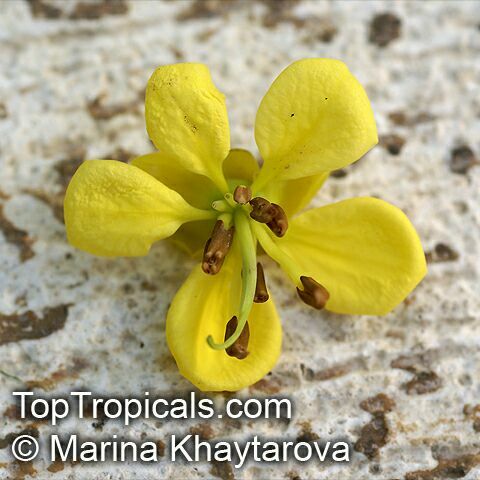 Cassia javanica - Apple Blossom Tree. 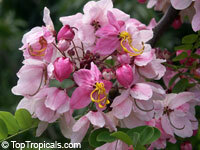 Beautiful pink apple-blossom-like flowers. A very showy summer bloomer. Magnificent flowers bloom with petals that change in color from pale red to dark red then paling again. 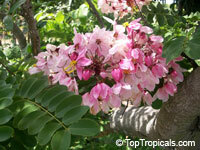 Flowers range from white to pink on the same branch and appear in dense clusters. 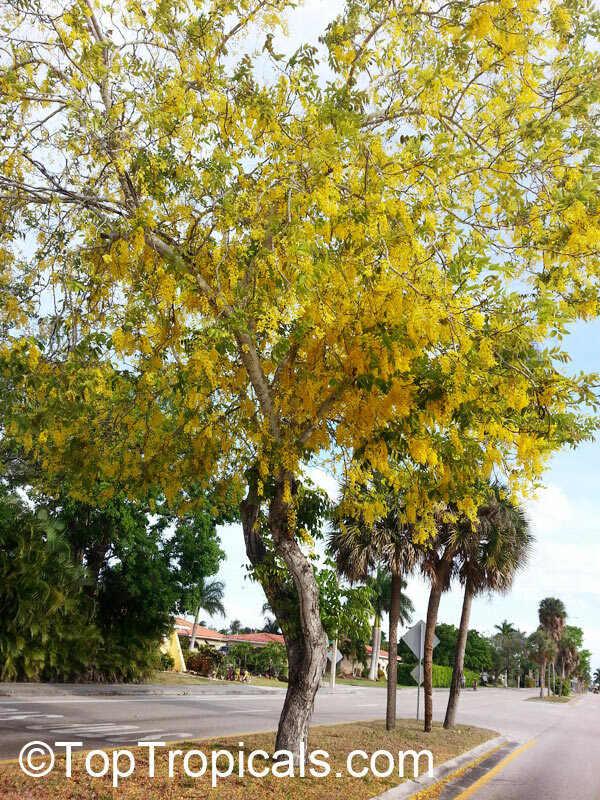 This tree is in bloom for over three months. A small tree with a wide-spreading crown and pale-green leaves. A very showy summer bloomer. Magnificent flowers bloom with petals that change in color from pale red to dark red then paling again. A great houseplant to grow! Flowers range from white to pink on the same branch and appear in dense clusters. Gold Medallion Tree. 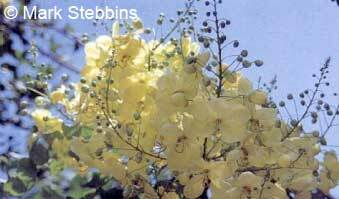 Beautiful clusters of yellow flowers from spring through summer and sporadically in fall and winter. Red Shower Tree. Beautiful medium size tree with bright pink flowers with shades of orange and red. While having spreading crown, it also has very strong root system and flexible branches, making it a wind-tolerant tree and one of the strongest hurricane survivors, safe in landscape. Beautiful medium size tree with bright pink flowers. Soak seeds before planting. Pink Shower Tree, Appleblossom Tree. 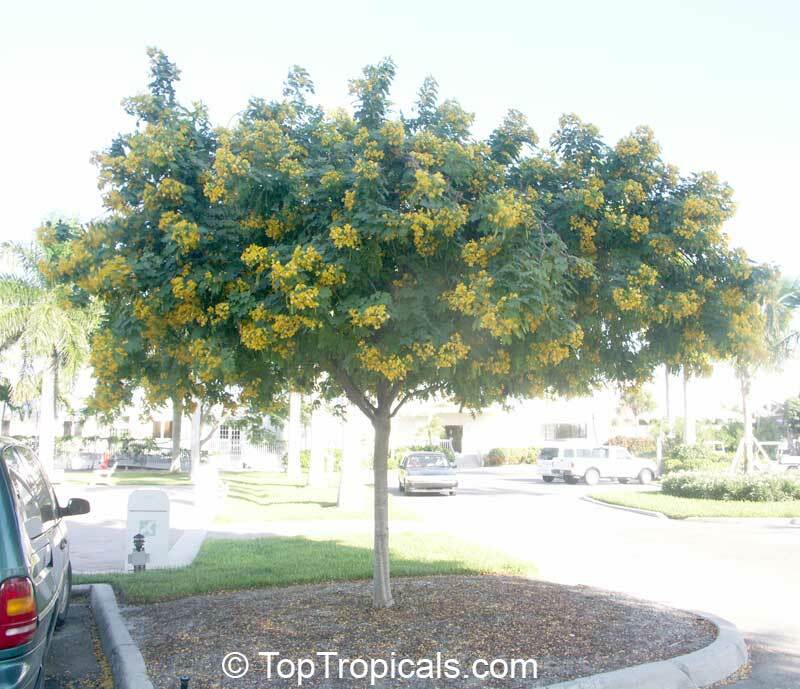 Spectacular medium size fast growing tree with a fine spreading crown. Masses of bubbly fragrant pink appleblossom flowers (over 2 inches across) appear in spring-summer held in cascading clusters along downy branches. Lovely, tropical, rich green, pinnate foliage. 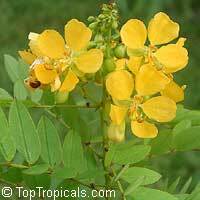 Coffee Senna, Fedegoso, Privet Cassia. 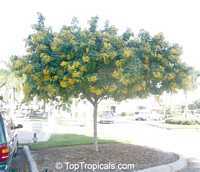 Medium size shrub with orange-yellow flowers from spring to fall. 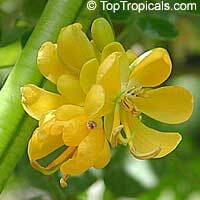 From distance, flowers look like little yellow hummingbirds and attract butterflies and bees. 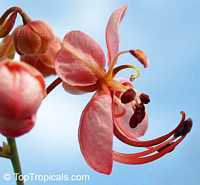 The plant is very ornamental not only due to its bloom but also to large, red-veined leaves. Propagation by seeds. 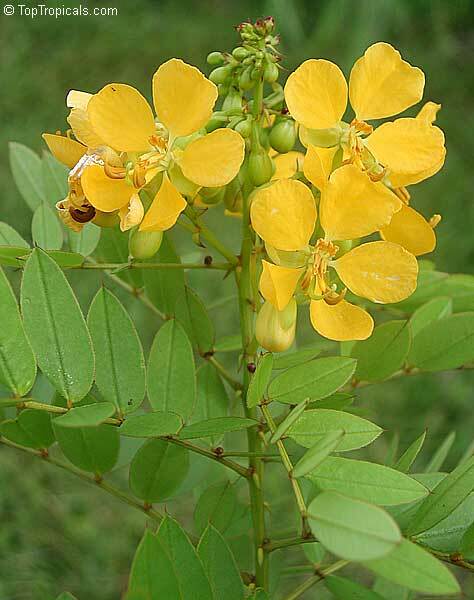 Red Cassia, Ceylon Senna. Graceful tree with spreading, drooping branches appearing to be overweighted by its wealth of clustering red blossoms. 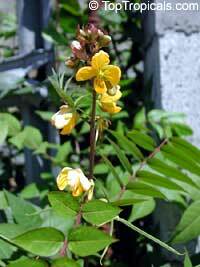 Has alternate pinnate leaves in pairs with colored margins which further enhance the appearance. Pre-soak the seeds for 18 hours in warm water. Plant 1/2" deep in well-drained soil mix. Keep warm and damp, full sun, high humidity. 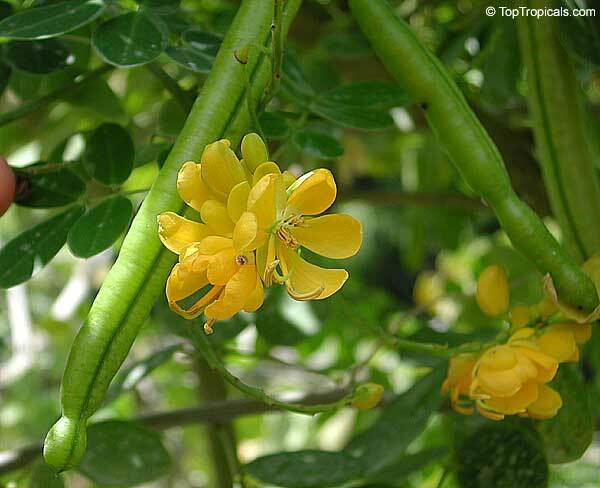 Kassod Tree, Siamese Senna. Leaves are yellowish green, pinnate and made up of elliptic leaflets. 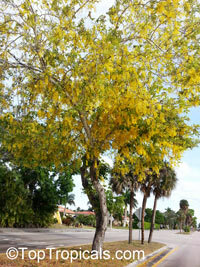 Panicles of yellow flowers bloom from spring to summer. Edible/Medicinal if used properly. Soak seeds overnight, plant 1/2" deep. Keep warm, in full sun, and damp.